With its year round balmy weather, Hawaii is a top vacation destination for people from all over the world. Hawaii offers long sunshine filled days, soft sandy beaches, untouched tropical landscapes and lush green rugged mountains. Whether you're looking to spoil yourself at a luxury resort or planning to holiday on a more undeveloped island, Hawaii has everything you could ever want in a beach vacation. Learn to surf, snorkel with turtles, windsurf, go diving or just soak up some sun. You deserve it! ​Have you booked accommodation yet? If not then take a look at bookings.com for rooms in Hawaii who have a huge selection of hotels, bed & breakfasts, lodges, hostels and even campgrounds. They have daily deals and discounts so its a good idea to keep an eye on rates. The best thing about this website is there is no booking fee and no charge for cancellations. Search for rooms below. If you're interested in renting out a whole house in Hawaii instead of a hotel room, you can search VRBO for options that include ocean-view condo's, cute cottages in tropical settings, and beach front homes. The best part is you can usually book a whole house for the same prices as a hotel room. This is a good option for special occasions such as family gatherings, group getaways and romantic escapes. Visit VRBO and see vacation homes available in Hawaii. Getting around the Hawaiian Islands without a car is pretty tricky. There is a public bus on the island of Oahu that is dirt cheap but it runs on island time. If you plan on doing some exploring and limited to a week of travel we suggest renting a car. There are a few car rental companies to choose from in Hawaii, including Avis, Budget and Dollar Rent-A-Car. Definitely reserve your rental car in advance as this is an island and your choice in vehicles could get booked out. ​Budget - Rent Twice, Get a $20 Bed Bath & Beyond Gift Card! Dollar Rent-A-Car - Enjoy Triple Miles from Alaska Airlines when you book with Dollar - when renting for 3 days or longer. Use code 100352, valid through December 31, 2018. ​Avis - Use promotional code A275900 and get 30% off when renting from select Avis locations. Oahu has a pretty good public bus system called TheBus. Fares are very cheap and you can even ride a loop around the whole island of Oahu. On the Big Island, the public bus system is called Hele-On with a few different routes that will take you to Hilo, Kailua and Waimea. There is no public bus service in Maui but there is a shuttle bus between the airport and Lahaina and Kaanapali every 30 minutes. There is limited public transport in Kauai. Honululu on the island of Oahu is the major airport hub. Travelers to other islands will probably need to take a connection flight from here. 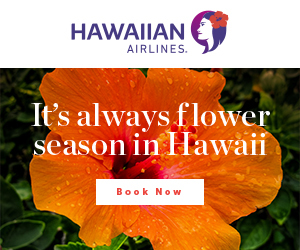 The largest airline carrier that serves between Hawaiian Islands and other international destinations is Hawaiian Airlines. You can usually find return airfares from Los Angeles for around $500. Have you thought about taking a cruise to visit Hawaii? Have you thought about taking a cruise to Hawaii or around Hawaii? Well, you have that option to think about too! We thought we would never enjoy a cruise style vacation but boy were we wrong!!! They are luxury... beautiful hotel style rooms with all your meals and entertainment covered. Sometimes you get to visit places you normally couldn't get to by car as well. Cruises sail out of Los Angeles, San Francisco, Vancouver and Honululu. You can visit CruiseDirect who offer great packages at discounted rates.